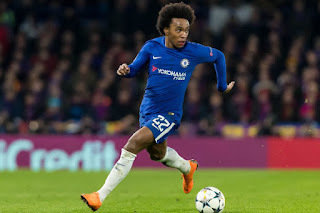 Willian was in top form yesterday during the match between Chelsea and Barcelona in the Champions League. The Brazillian winger was in the heart of every attack for Chelsea and he was unlucky to hit both the right and the left pole during the game. However, he was lucky the third when he received a pass from Eden Hazard and struck a powerful shot past Marc-Andre ter Stegen. Chelsea was unlucky during the game tho after Messi pulls an equalizer later in the game after a defensive mistake from Chelsea. The game ended 1-1 and Barca has an away goal to take back to Camp Nou. Frank Lampard was asked after the game about Willian performance and this was what he had to say: "He was excellent, he was the man. We were all looking at Hazard pre-game but I think Willian was the man tonight." "He was unlucky with both of his strikes in the first-half. He showed Barcelona what he can do which is to shift to his right foot which we saw twice with a couple of sighters and on the third time he buries it." "It was an absolutely fantastic goal from him." Lampard also speaks about his days at Chelsea and revealed Willian has always produce magic moments in training but urged the Brazillian to improve his consistency in matches. Lampard continued: "He uses [Ivan] Rakitic brilliantly. He bends it around Rakitic and the goalkeeper is completely unsighted. He sets it outside and brings it back in." "I've seen him do it in training time and time again. When you're talking about him not playing and you're talking about a level of consistency with him, you want to see him do that all the time. "Some say he's a victim of the structure of the team because Pedro has been impressive and it's a given that Eden Hazard will play pretty much every game." "It's been up to him to show that he's the man. I don't think he's always done it but on that form tonight he's one of the top players."